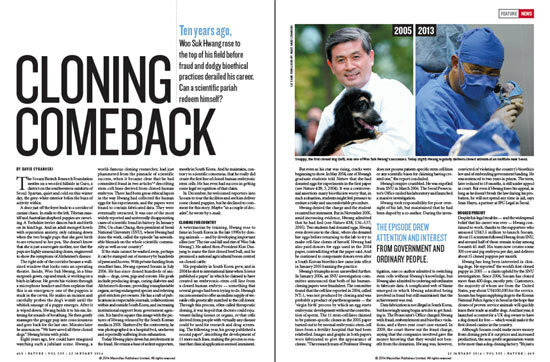 The scientific journal Nature’s article of “Cloning Comeback,” featuring Korean scientist Hwang Woo-suk’s recent findings related to cloning, has drawn mixed reviews by global experts. The journal detailed an update on the Sooam Biotech Research Foundation led by Hwang. The former professor at the nation’s prestigious Seoul National University was derailed from his career after his articles on stem cells from cloned human embryos turned out to be fabricated. His fall had sent shockwaves throughout the scientific community as Hwang had been hailed as a hero with his breakthrough in stem cell research. The fact that such papers are being published in peer-reviewed journals may signal a rise in legitimacy of their findings, some observers said. They give credit to the scandal for sparking a boom in stem-cell funding including Kim Hyo-soo, a stem cell scientist at Seoul National University hospital. The journal also stated that Sooam and a Russian institute have joined forces for a bid to clone a mammoth from ancient tissue, but Seo Jeong-sun, director of the Genomic Medicine Institute at SNU feared it would “be just for show.” He pointed out Hwang is not an expert on stem cells as he is in animal-cloning technology. A dominant number of experts are said to be in doubt of the validity of his research despite the institute had published more than 40 papers documenting his incremental progress in cloning. “Some reviewers are a little hesitant to take Sooam’s manuscripts seriously, but overall they are treated fairly,” said Hwang In-sung, a researcher at the institute.